Kamchatka It is a unique place (peninsula in the far east of Russia) was born of fire, like the Earth itself. Kamchatka has never seen quiet - its history is one of continuous, violent rebirth. It is the most active area of our planet where volcanic activity manifests itself in all its beauty. Almost everywhere the skyline is contoured with volcanoes. It composed of more than 160 volcanoes, 29 of which are still active. In addition there is a multitude of thermal and mineral springs, geysers and other phenomena of active volcanism. The volcanic area of Kamchatka has been declared since 1996 a World Heritage Site by UNESCO. Kamchatka is no doubt one of the most beautiful places you’ve ever seen in your life. - Bring: insect repellent, sweater or light jacket, cap depending on weather. Highly comfortable car will bring you to the Vilyuchinsky volcano. Accompanied by a guide to the transition to the Vilyuchinsky waterfall .. 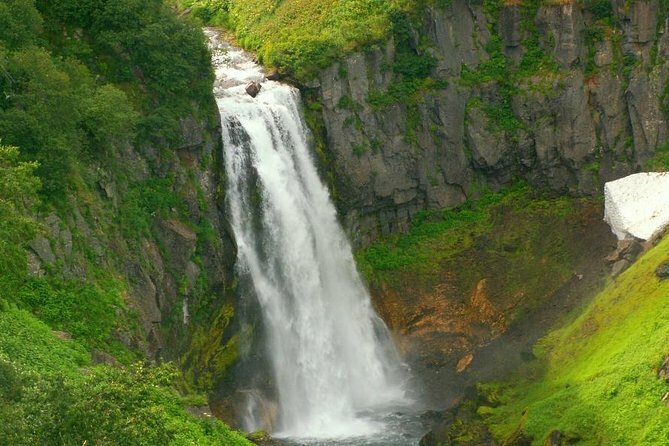 The waterfall is located on one of the slopes of the Vilyuchinsky volcano (the second name is the Vilyuchinskaya volcano volcano) and is due to a melting snowfield. The rapid cascade of water falls from a cliff and falls into the abyss from a height of several tens of meters. Fascinating spectacle! The height of the main cascade is about 40 m, then a stream of water is hidden under the snowfield, located below, under the stream, along which the last 100 m of the route passes. On your way to the waterfall, you will pass through the stone-birch forest, here and there covered with huge stone blocks - volcanic bombs. The route to this interesting natural object is not difficult - from the parking lot near the highway (height 210m above sea level) to the foot of the waterfall (height 510m) the distance along the trail is 2 km. The tour itself will take 2-3 hours. After climbing you will have lunch on the banks of the picturesque river.On the way back you will visit the Upper Paratunsky springs located on the hill of Hot. The rise to the exit of thermal waters is quite steep, but low - about 70 m. Thermal water from the keys, flowing down the slope, forms hot streams, merging into warm waterfalls and natural baths in which you can swim.